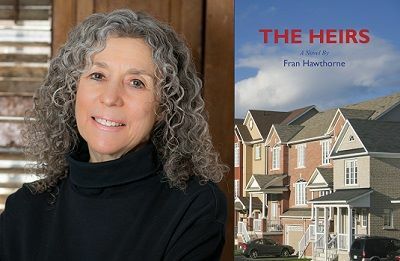 Celebrating Author Fran Hawthorne (Rabbi Linda’s Cousin) and her new novel “The Heirs” and featuring a live taping for the WriteBoom podcast with interview by podcast host, Jason Noxon. Fran Hawthorne has spent a three-decade career writing award-winning nonfiction, including eight books, mainly about consumer activism and business social responsibility. For instance, her book Ethical Chic: The Inside Story of the Companies We Think We Love (Beacon Press) was named one of the best books of 2012 by Library Journal. Now she has published her debut novel, The Heirs, set in New Jersey in 1999, with a theme of multi-generational Holocaust guilt. After breaking her hip in a serious accident, Eleanor Ritter’s mother, Rose, a Holocaust survivor now living in New Jersey, suddenly starts talking about her harrowing childhood in Poland and the taboo subjects she has refused to discuss for half a century -– even speaking in long-forgotten Polish. Around the same time, Eleanor learns that the parents of her nine-year-old son’s soccer teammate, Tadek, are Catholics from Poland.